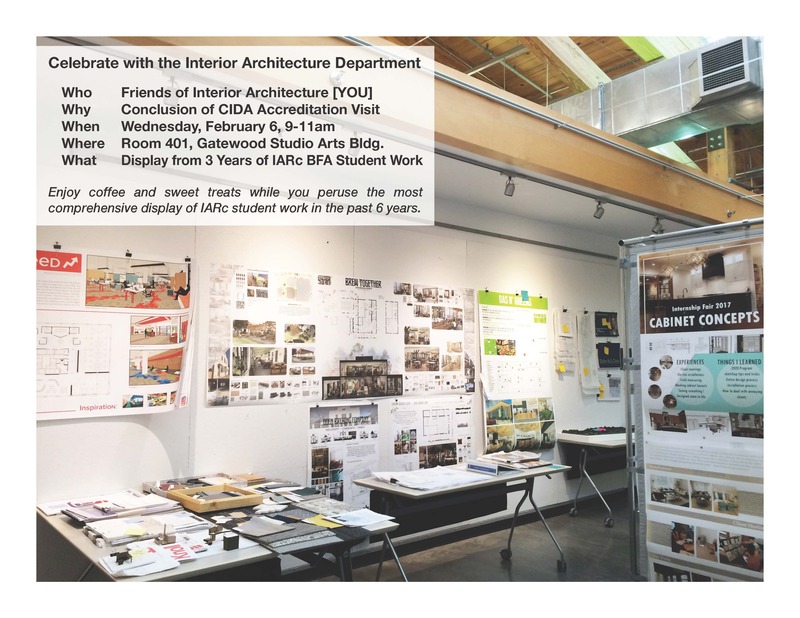 On behalf of the Interior Architecture faculty, staff, and students, we invite you to a display of our BFA students’ work. We have been working hard over the past 3 years to generate and collect work in preparation for our re-accreditation visit, and we have assembled that work in the Gatewood building. On Friday, Feb 1, 2019, a team of three volunteers representing the Council for Interior Design Accreditation (CIDA), from both the profession and the academy, will descend upon our department to scrutinize the evidence that is on display. The last time we had such a display was during our previous re-accreditation visit six years ago. We would like to invite you to stop by the day after the CIDA team leaves campus and check out the state of interior architecture education at UNCG. Drop in next Wednesday, February 6, 9-11 am, for some coffee, sweets, and conversation while you review the work. Stay for as long as you are able, and I hope to see you there!